This past week, I went to help my parents pack up their house. It’s a huge job, and the house is filled with tons of memories. Boxes are filled with old toys, school papers, and books. It was like going on a treasure hunt, in a way, but the goal was to find the treasure, pause in recognition (“Oh! I remember that! !”), and then toss the item either into the trash, the give-away pile, or the keep forever box. And that keep forever box? It just gets shoved in the attic for another few years, carried from new house to new house, waiting to be discovered again and looked at with love, before getting thrust back into the cobwebs. I can’t figure out why we save snippets of our childhood in neatly stacked boxes in garages for no one to see. They become security blankets, dragged from place to place sometimes growing with time. It can get out of control. If I couldn’t identify who made it, I threw it out. If it could have been made by anyone (colored in sheets, papers that simply had objects glued), I threw it out. If it was made for me, like for Mother’s Day, I put it in my box. If the boxes became full, I would remove some things and decide again what to keep. The idea was there would only be one box per kid. I eliminated all the old papers and projects and everyone knew they had a box of memories to show their own kids one day, and I had my own nostalgia box for when I was 90. But at my parents home, finding my old things, the boxes my mother had saved, I found that those memories became something different. We spend so much time being someone else – someone’s child, someone’s spouse, someone’s parent – that our own selves tend to get lost somewhere. These glimpses of childhood take us to the moments when we were forming ourselves. They are snapshots of our souls in progress. They are, in essence, like Horcruxes. The spelling test from third grade, the “Book About Me” from pre-K, the first doll, the baby blanket – they are tangible parts of a life past. Saving them all these years represents the very human desire to hold onto youth – to not change. To go back somehow. Others, like the letter from my grandmother, are quite literally, a part of a soul long gone. Interestingly, I found myself throwing out a lot of the things that I had put aside years ago into my mother’s “forever box.” Letters from old friends that I had lost touch with weren’t important anymore. A research paper that I had worked so hard on and was so proud of was easily tossed. The things that I had felt defined me – were important to me – suddenly didn’t carry that same weight. There are some people who don’t hold on to anything. 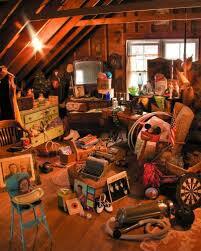 They convert their attics and throw everything out. Always looking forward, I guess. Others hang on to every piece of paper, every old T-shirt, every floppy disk that can’t be used. Me? I guess I am somewhere in the middle. I left my parents home with a new box. I took my old doll, some children’s books, and poems I wrote when I was in High School. I know I will share them with my kids and then put them away. Maybe for a rainy day somewhere down the line, when my kids have grown up and left the house, when I want to remember the times when I was still finding myself and forging my path. I don’t know how to describe the smile on my face or the tear in my eye. I am grateful to have been present to hear the giggles, the exclamations of discovery, the “Oh my G…! I remember THIS!” Thank you, Adina, for your meaningful words. I think I’ll print up this article and put it in a box…and…..here we go again! …and since we didn’t finish, I know you’ll be hearing them again! This is one of the best blogs I’ve ever read! I’m going thru this myself…maybe that is why it made me feel kind of choked up. I’ll be back to visit! Thanks so much! I look forward to your comments! As Billy Joel once put it: It’s all about soul. I would have a hard time clearing them. They all end up looking like treasures some how.